On the first day of my cruise along the Mekong Delta, we visited a floating market. The floating market is open all day long, but the busiest time is in the morning, when the weather is cool, a light frost is on the river and the sun is sparkling off the water. If you want to go see the floating market at its peak, you’ll have to wake up very early. Heading out early in the morning is more relaxing as you cruise along the Mekong with a fine mist over the water as you head towards the floating market where hundreds of boats are peddling their wares in the bustling markets. Take a deep breath and smell the fresh tropical fruits as boats display various kinds of fruits for the day. The floating markets on the Mekong River are very peaceful and enjoyable, because of this, it is a successful way for the farmers to sell their goods. Unlike most mainland markets, the floating markets are crowded but not noisy. If you hear some loud noise, its usually a boat motor. One of the most beautiful floating markets in the Mekong is called Cai Rang, located in Can Tho Province. Here, they have their own “marketing” method called “Beo Hang”. On the front of the boat there is often a long pole and the vendor will hang all the goods that they have to sell that day. Beo Hang really shows the unique trading culture of the floating markets. There is very little noise, no crowded streets and everyone is relaxed, this unique way of buying and selling continues to attract thousands of tourists every year. 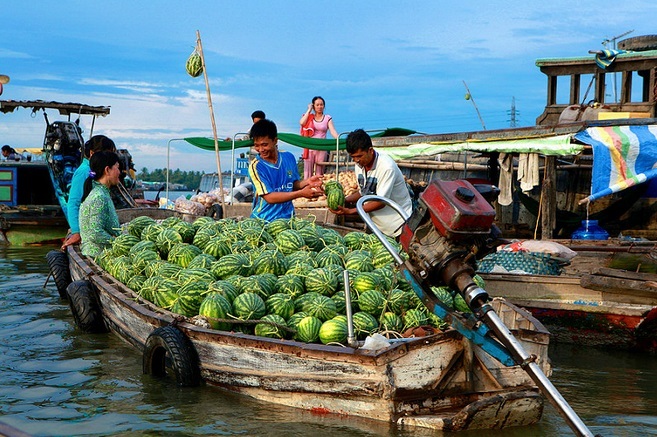 Another popular floating market called Cai Be is filled with colorful fruits such as watermelon, pineapple, dragon fruit, mangosteen, and more, that change as often as the seasons. Our guide arranged for us to visit a local garden that was included on our Mekong River cruise. Cruising down some rather small canals, I can feel the calm, fresh air and I see how prosperous the land around the Mekong truly is. There are many lush gardens with flowers and ripe jack-fruits near the local houses as we cruise along the river. As we’re cruising by, one of the locals reaches out to my boat and hands me a jack-fruit for free as a passing visitor. I quickly motion a thank you as we continue down the narrow canals. This is fairly common I’m told by my guide. The floating market and the people I met on my Mekong River Tour is a beautiful reminder of the real lives of sincere hard working people along the Mekong. As tourists, having a chance to visit the Mekong Delta, it’s an unforgettable place. The people here will never be changed by urban life, it is idyllic, simple people who are always friendly each time I visit the magic on the rivers of the Mekong.